When you see what food each state hates, you'll find that some states are oddly specific about what food they strongly dislike. Just over a month ago, a recently new dating app, Hater, discovered what every state hates the most...in general, at least. Recently, statistics from that same app were used to discover what food each state hates. 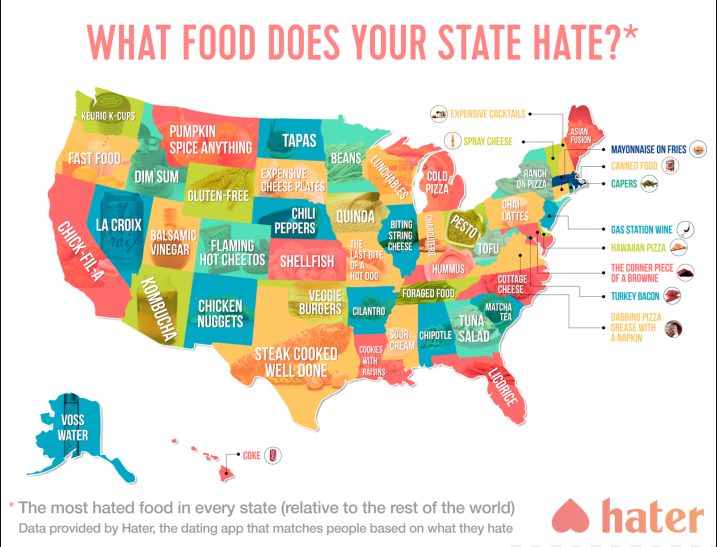 The previous result for North Dakota stands as it seems we hate "tapas" the most. It was the results from the other states that left us thinking how strange it is what some of the foods are that other states are displeased with the most. Some examples are listed below. Californians hate "Chick-fil-a." Apparently, they don't know how good they've got it with those around. Alaska hates "Voss Water." While I can't argue with the fact that it seems overpriced and some people think even less of it, it's tough to wonder how a particular brand of drinking water winds up on the list. Missouri hates "The Last Bite of a Hot Dog." Perhaps they're sick of it by the time they're 95% done with it? Illinois hates "Biting String Cheese." Maybe stop biting it and eat string cheese like normal people do and you won't have a problem with it. These are just a few foods that states hate. The list only gets even weirder from there. For the full map, you can check it out here. Enjoy your food, everyone.